Bravo had a fun interview with Rayudu after CSK's victory against RR. Chennai Super Kings (CSK) won a thriller of a contest against Rajasthan Royals on the last ball. They are now comfortably placed at the top of the table with 12 points to their name in just 7 matches. 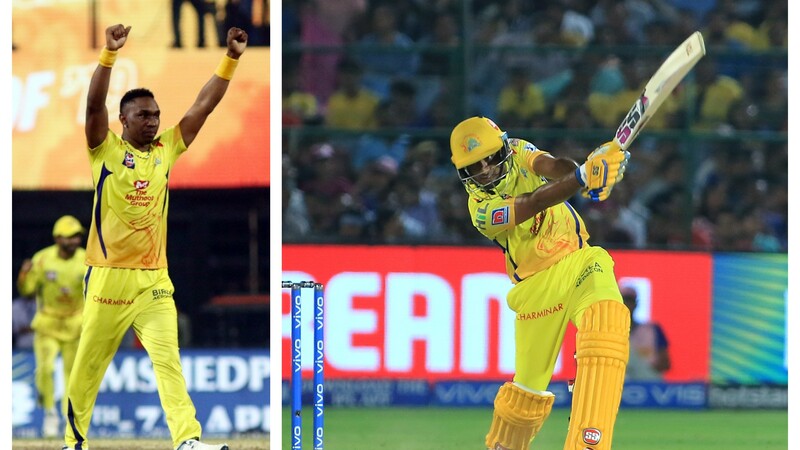 The brilliant performances in the match that led to CSK’s victory were overshadowed by the controversial incident that took place in the final over when Dhoni entered the field and argued with the umpires regarding the ‘no ball’ decision. Ambati Rayudu and captain MS Dhoni scored fifties on a pitch which was tough to bat on and made the victory possible. The former supported Dhoni and kept the runs coming from one end. He started a bit slow but got the runs later at a better pace displaying his trademark shots. Rayudu scored 57 runs off 47 balls including 2 boundaries and 3 sixes. CSK uploaded a video on their social media where all-rounder DJ Bravo was seen asking Rayudu some questions about his innings and also said that India needed somebody like him at the No. 4 position for the CWC 2019 and he fully endorsed Rayudu for the spot. They also joked about the Hyderabadi batsman performing so well because he had dinner with the Caribbean all-rounder the previous night and now he must continue doing the same before rest of the matches. Rayudu was seen answering in his humble way and in a soft voice like his most interviews.